Whether you own a store, a restaurant, an office building or are in charge of cleaning businesses or institutions like schools and hospitals, you need the right equipment to get the job done. Cleaning in commercial settings is very different from cleaning in homes. The differences in flooring, the heavier amount of traffic and the need to keep conditions clean and sanitary all require a unique approach to cleaning. To truly get the job done right, you need the right commercial vacuum or cleaning equipment, and GoVacuum Outlet Centers in Chantilly and Herndon, Virginia can help you get everything you need to handle commercial cleaning tasks. Why GoVacuum Outlet Centers for Your Commercial Vacuum? Whatever you need to handle floor care in a business or institution, we have it on GoVacuum.com for you to purchase and pick up in the DMV at our Chantilly or Hendon vacuum stores, and we often have special in-store only savings to offer. So why should you buy from our Herndon and Chantilly vacuum shops? 1. Our prices are well below both retail and Internet prices. 2. We have 12 months same as cash financing available. 3. Our sales associates have expert expert knowledge and can help you make the best decision. 4. 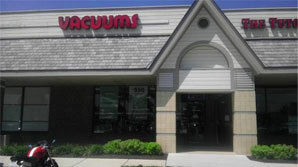 No other vacuum store in the DMV has such a great selection of commercial floor care products. 5. Shopping at GoVacuum Outlet Stress is supporting a local, family-owned business. 6. You can get the parts you need for maintaining your equipment all in one place. 7. We have a full-service commercial floor care equipment repair service onsite and will be glad to have a look at your old model to see if it can be fixed before you make your purchase. The products on offer at our Herndon and Chantilly GoVacuum Outlet Centers can change daily based on stock surpluses, customer returns and repairs performed in-house. If you’d like to call us before visiting, you can do so by calling our Herndon GoVacuum Outlet Center at (703) 471-7979 or, simply come on in and talk to one of our sales associates in person. Our store in Herndon is open Monday to Friday, 10:00am to 7:00pm and Saturday 10:00am to 7:00pm.